Fort Arbuckle – Fort Arbuckle was a fort established on the northeast shore of Lake Arbuckle, 12 miles east of Fort Clinch in Polk County, Florida. It was built in 1850 as part of a ring of civilian and military posts created to protect settlers in the interior of southwest Florida. That year, it was also used as a staging area to move many of the Seminole Indians westward. After 60 men, women and children were assembled at the fort, they were put aboard the steamer Fashion, bound for New Orleans, Louisiana in February 1850. There are no remains of the fort today. Fort Barker – During the Seminole Wars, there was considerable fighting taking place along the Steinhatchee River in northern Florida. Three forts, including Forts Baker, Macomb, and Downing were erected in Lafayette County. Fort Barker was located nine miles southwest of Fort Macomb on the west side of the Steinhatchee River, near modern-day Cooks Hammock, Florida. 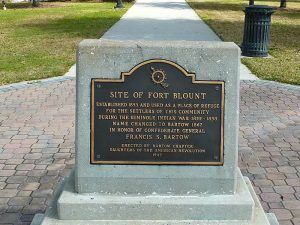 Fort Blount – In October 1851, Redding Blount led a party of 21 white pioneers and 12 black slaves to the area and settled west of current downtown Bartow. The settlers, which included Blount’s four sons and their families soon established a blockhouse for their protection. The settlement was named Fort Blount after the fort but was later renamed Pease Creek until it was named Bartow in 1867. The blockhouse was probably abandoned as a fortification before the end of the Third Seminole War in 1858. There are no remains today but the site is marked by a small monument in the Fort Blount Park. 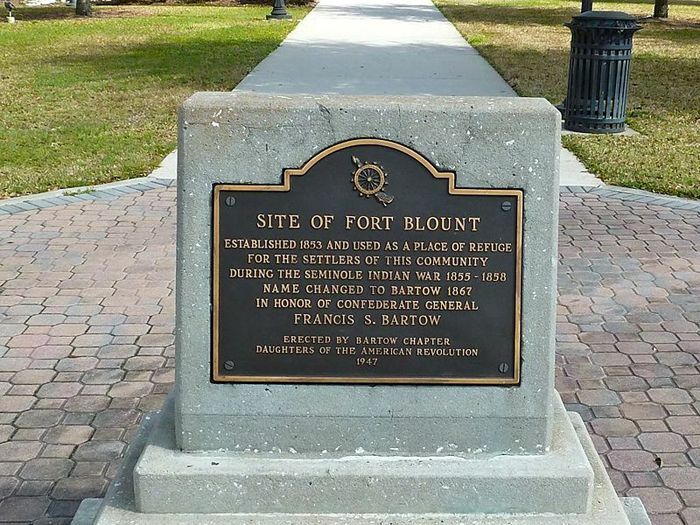 Fort Butler – Located on the west bank of the St. Johns River, Fort Butler was built in 1838 during the Second Seminole War. Named after the surveyor general of the Florida territory, Robert Butler, it consisted of a crude log stockade and barracks for the garrison. The Fort was one of the military installations designed to protect the St. Johns River, which served as an important artery of communication with the garrisons in central Florida. On the opposite bank, near the frontier settlement of Volusia, stood Fort Call. There are no remains of the fort today but a historic marker is located near the St John’s River Bridge on the side of State Road 40, in Astor, Florida. Fort Call – This U.S. Army post was established in December 1836 during the Second Seminole War by Captain John L. Gardner in present-day Worthington Springs, Florida. 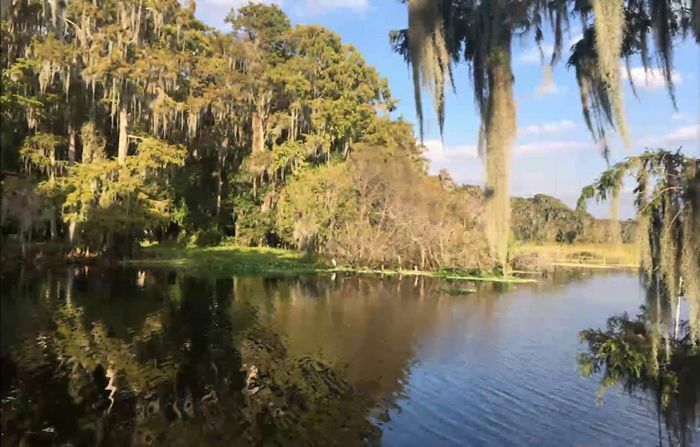 It was established after the Battle of Wahoo Swamp in November 1836 and named for General Richard K. Call, the Florida Governor and commander during the battle. During this time, many of the early settlements in Union County were attacked by the Seminole and people sought protection at the fort. The fort was abandoned in March 1838. Several years later, in 1845, a Methodist Church was built near the fort. Though there are no remains of the fort or the church today, the FortCall Cemetery, which was established by the church, still exists. Fort Capron – This U.S. Army post established in March 1850 by Captain Erastus A. Capron, 1st U.S. Artillery, in the present day town of St. Lucie, Florida. It was built to replace old Fort Pierce, which had burnt down in 1843 after being decommissioned. The settlement of St. Lucie grew up around the fort. The post was last commanded by Captain Abner Doubleday when it was evacuated in June 1858. 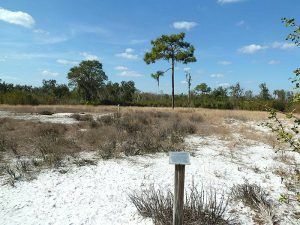 The post was one of the last Seminole War forts to be abandoned. 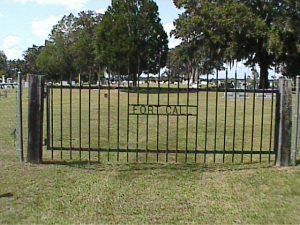 Nothing remains of the fort today, but its location is remembered with a monument in the St. Lucie Village Historic District. Fort Carroll – A stockade type depot, this post was erected by Captain T.P. Guynn and member of the 8th U.S. Infantry while on a march to the Kissimmee River during the Second Seminole War. 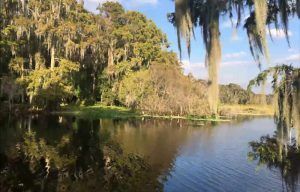 Built in January 1841, it was named in honor of Sergeant-Major Francis Carroll who suffered a hero’s death at the hands of Indians near Micanopy. It was abandoned in 1841 in favor of Fort Cummings. The fort was located in present-day Polk County, Florida. There are no remains today. Fort Casey – A temporary U.S. Army post established in 1850 during the Second Seminole War in Lee County, Florida. It was named for Captain John C. Casey, the Commissioner for the Removal of the Seminole Indians from Florida. It was abandoned the same year it was built. Fort Chokonikla -Located near Bowling Green in Hardee County, Florida, this post was established in October 1849 in response to hostile Indian attacks in the area. The site was on high ground near the confluence of Paynes Creek and the Peace River and near the Kennedy-Darling trading post. The fort consisted of three square blockhouses for defense and canvas tents for housing. This was the first of several forts built in a chain from the Manatee River to the Indian River. It was abandoned in July 1850 because of the poor health conditions at the site. There are no remains of the fort today. The site is located in Paynes Creek Historic State Park,in Bowling Green, Florida. 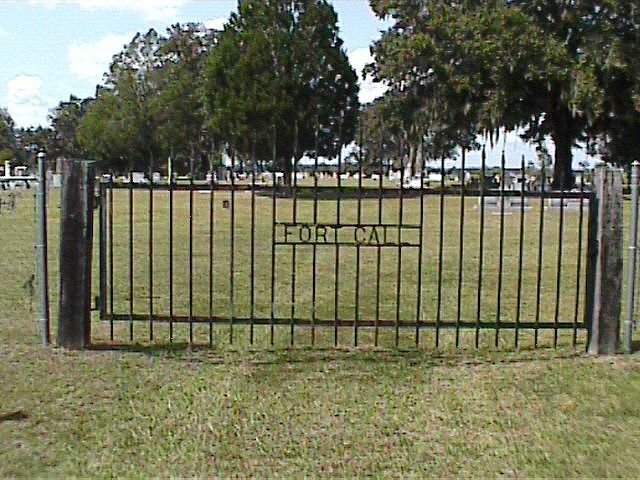 Fort Clarke -Originally a U.S. Army post during the Seminole Wars, and afterward a settlement, it was named for Lieutenant Henry Clarke, 5th U.S. Infantry. At this site, crossed the early settlement and military road connecting the old county seats at Newnansville, near present-day Alachua, and Spring Grove with Micanopy. It was abandoned in 1840 but reoccupied in 1861 during the Civil War. The site, which has no remains today, is located in Gainsville, Florida. 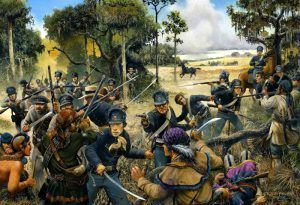 Fort Defiance/Fort Micanopy – Located in the present-day city of Micanopy, Florida, both Fort Defiance (1835–1836) and Fort Micanopy (1837–1843) were located here during the Second Seminole War. The U.S. Army first established Fort Defiance in December 1835 after much destruction had taken place in the area. Sugar plantations and homesteads were burned and entire families sought the safety in the village of Micanopy. 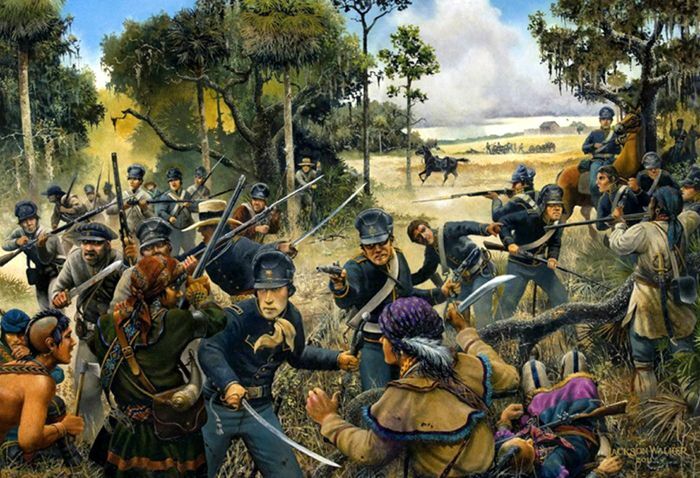 During the summer of 1836, the Battle of Micanopy and the Battle of Welika Pond took place along the road southwest from Fort Defiance to Fort Wacahoota. On August 24, with most of the soldiers sick or wounded, the U.S. Army evacuated the fort and town and all buildings were intentionally burned. Afterward, Fort Micanopy was erected in 1837. This second fort lasted throughout the Second Seminole War until it ended in 1842. It was abandoned in 1843. There are no remains today. Fort Drum – A U.S. Army post established in 1849 between the Second Seminole War and the Third Seminole War near the present day town of Fort Drum, Florida. After the end of the Second Seminole War in 1842, the U.S. Army built a network of forts across the central part of the state, with military roads that connected them. Fort Drum was located where two of these roads crossed. It was deactivated on May 28, 1850, but reoccupied in 1856. It was abandoned in 1861 at the start of the Civil War. It was located on the east side of Drum Creek two miles south of the present day town of Fort Drum. There are no remains today. Fort Duval – This temporary stockade built in November 1826 to guard the mouth of the Suwannee River. Located about ¼ mile from the Seminole Indian Agency, it was constructed by Captain Francis Langhorne Dade and 120 troops. The fort measured 140 by 130 feet, was six feet high, with portholes for firing. The troops lived in crude lumber huts. It was named for territorial governor William Pope Duval. By 1841, it was gone.